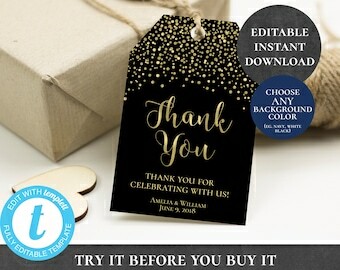 This listing is for an 'Instant Download' high-resolution, EDITABLE, PRINTABLE thank you tags. Access your template(s) within minutes of purchase. Customize in your computer web browser. No software installations or font downloads. Try our FREE DEMO of this listing (link below). 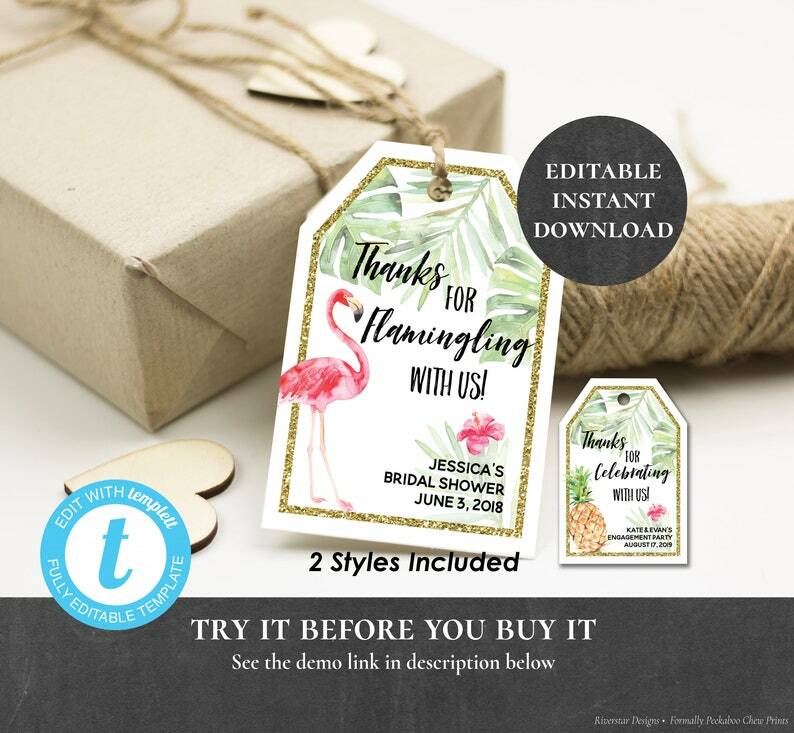 Thank you tags measure approximately 2.4x3.6"
-Change any of the text to adapt for any event. 3. Edit your template(s). Save. Download. 4. Print (at home, a copy centre, or online print shop). You can save & continue editing your template at any time. * The template will NOT work on a tablet, phone, or mobile device. Colours may appear different on your screen than when printed due to differences in individual screen and/or printer settings. We cannot be held responsible for any alteration of the files, poor print quality or printing errors caused by your printer. Digital files are for ONE-TIME USE ONLY. 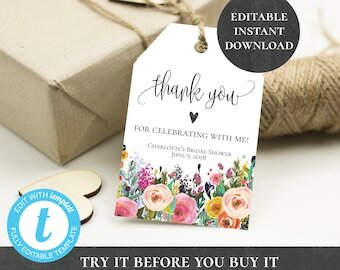 If your purchase includes a Templett.com editable template, please note you can edit, save and download your template 25 times for a single project/event. Templett templates will be available for 1 year from the time of purchase. Riverstar Paperie reserves the right to revoke access to a template if the user fails to comply with the terms. © Copyright of Riverstar Paperie. For personal use only and not for resale. No part of any content, description or template may be reproduced in any form. All rights reserved. Easy to edit and printed very well. How do I DOWNLOAD my NON-EDITABLE and/or my ADOBE READER EDITABLE files? 3. Select "Purchases & Reviews"
Adobe Reader Editable Files - How do I edit? 4. Print page(s) you filled in, then delete the names you just printed out, add in new names, print out again. Repeat until you have all the cards needed. How do I access / edit / download my TEMPLETT EDITABLE files? 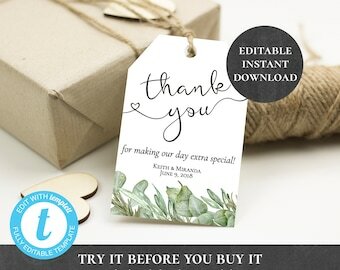 If you ordered a TEMPLETT EDITABLE file, you will receive an email from Templett.com several minutes after purchase with a LINK to your template file(s). 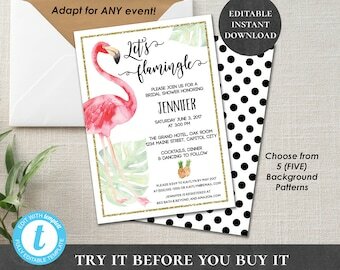 Log in to Templett to edit, save & download your templates for print. You can choose to download your files as JPEG or PDF. Other download options include printing with or without bleed for JPEGs, and with or without trim marks on the PDF. With PDF you can also choose to have multiple items print per 8.5x11" or A4 sized paper sheet (turn the SAVE PAPER option ON to print multiple items per sheet of paper). What kind of paper / sticker should I print on? 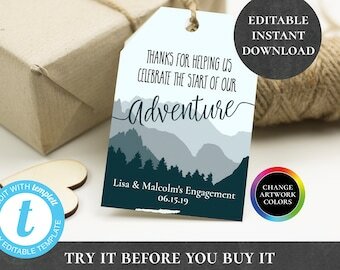 Editable templates are set up to print on FULL SHEET paper (card stock, sticker, label paper etc). 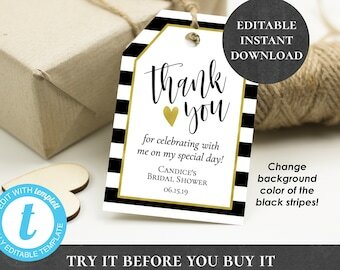 Most templates are NOT set up for a specific Avery label or card. However, if you need a label changed in size to fit a specific label, please message us. We like heavy weight card stock (e.g. 100 lb), of any kind (glossy, pearl, matte, etc). We recommend GLOSSY paper for any faux gold / silver / rose gold foil designs. For labels & stickers, we recommend full sheet label paper (e.g. Avery Full Sheet Labels 8165). For labels on wine bottles, water bottles, etc. you may want a full sheet label paper or film with water resistance (e.g. https://amzn.to/2KR3d0x). For posters, we recommend having foam backing on your printable. How / Where can I print my files? You can easily print your files on a home printer or at a professional print centre. When printing from home use the highest quality printer settings. Ensure you use the correct size paper & your printer is set to print actual size (rather than 'fill page'). When printing on exact size paper (e.g. 5x7") use the "borderless" printing option. 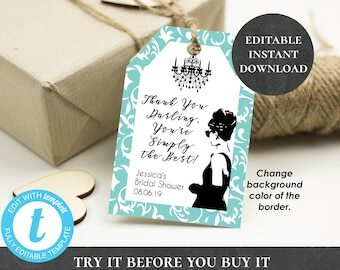 TEMPLETT templates can be downloaded as JPEG & are printable at online print shops like VistaPrint. Once all files are printed simply cut along the cut lines (a paper slicer / trimmer can be VERY helpful, and quite affordable). All designs are copyrighted to Riverstar Paperie. All Rights Reserved. You may print out as many copies of the file as you'd like for your OWN PERSONAL USE. 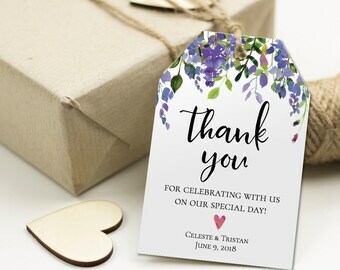 Printable downloads can be used for personal events, or used in home, office, business environments. Commercial reproduction or resale of templates or designs is not permitted at any time. Editable templates are licensed for ONE TIME USE ONLY. The template must be purchased EACH TIME it will be used for a different event. I reserve the right to revoke online access to templates should this license be violated. Kindly respect the copyright, and remember this is a small working from home Mama business. If you have any questions, please feel free to contact me in my shop! Fonts - Do I need to download any fonts for my editable files? 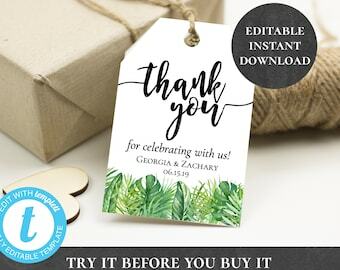 You do not need to download any fonts for my editable templates. 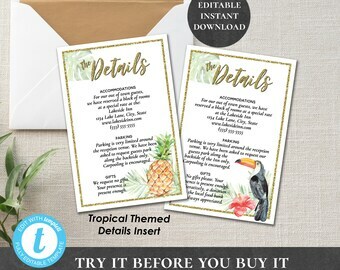 We provide a huge selection of fonts to choose from in the Templett.com editable templates. For Adobe Reader editable templates, the fonts shown in the examples are embedded into that file for use with that file only. Files do need to be edited in Adobe Reader installed on a computer to access the embedded files. If files are opened in a different PDF viewer than Adobe Reader, please re-download your files, as this can disable the embedded fonts. 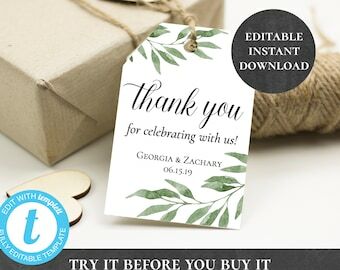 Please note I do not give out the names of the fonts I use in my invitations and editable files, as this is an integral part of my designs and I have spent countless hours hunting down the perfect fonts for my designs. The purchase of a template is for ONE-TIME USE ONLY. You can edit, save and download your template 25 times for a single project and/or event. Your Templett.com template will be available to you for 1 year from the time of purchase. If you find you need additional downloads, or additional time, please message me with your request. The viewing, printing or downloading of any content, graphics or templates from Riverstar Paperie is solely for your OWN PERSONAL USE and NOT for republication, distribution, sale or other use. No part of any content, description or template may be reproduced in any form. How do I set up my table seating chart alphabetically or by long table? We include sample alphabetical and sample long table layouts with every Table Seating Chart purchase. When time allows, I do still accept customization requests. If you would like an item to match one of my suites, please message me. And, if you love one of my designs and have a few ideas on how you'd like it changed don't hesitate to contact me through Etsy Conversations. Please note that instant download items that are not editable are 'as shown' in pictures. If you would like alterations, please send us a message prior to your purchase. We do charge a small customization fee for custom orders, to help cover additional design time. When possible, I generally aim to offer short turn around times for custom orders (frequently within 1-2 business days).